We asked our members to share their Alaskan journeys in 1,000 words for the Nov/Dec in 2017…and this was my mother’s favorite issue and she still reads it over and over. She loves Alaska. She’s never been and it’s on bucket list – still at 73 years young. Will she ever be able to go? I’m not sure, but she has seen more of the country than ever since I’ve been working at Workamper News and I will continue to take her on these journeys for as long as possible. Join us, on a Journey to Alaska. One thousand words? How about thousands of pictures instead? Or a thousand memories of sweeping vistas, gravel roads, raging rivers, pristine lakes, the Milepost, whales, moose, bear, cracked windshields, lumber trucks, wildflowers, eagles, puffins, murres, 23-hour days, mosquitos, countless waterfalls and Wow! For every negative, there are a thousand spectacular positives about traveling to Alaska by RV. We have done it twice from Pennsylvania; a round trip of more than 13,000 miles. From the first view of glacier-capped mountains to the moment when Mt. McKinley deigns to show its face, Alaska is a world of breathtaking “firsts”: the sight of thousands of salmon struggling against raging rivers to spawn and die; the sight of eagles in the sky, on the beaches, and in the trees; the wonder of watching a pod of hump-backed whales coordinate the corralling of thousands of bait fish then lunging as one to greedily consume their catch; watching grizzly and moose mothers teach their young life lessons needed for survival. Alaska is a place where memories are made around each corner. Long after the journey’s end, the sights and sounds of Alaska remain with us and… did I mention the thousands of pictures? In the spring of 2014, my lady (wife) and I were in Las Cruces (NM). We were looking for a Workamper assignment with our main interest being somewhere in Washington or Oregon – but at the last minute I tossed Alaska into the equation. We eventually settled on Alaska – a decision not to be taken lightly as there were a number of logistical issues to be considered. Just the cost of the diesel it would take to drive the Ponderosa (our 38 foot Fleetwood Bounder motorhome) to Alaska would probably deter most people from even considering making the trip – BUT this was a once in a lifetime experience so what choice did we really have? We left the lower-48 in May, arriving at our Workamper hotel /motel assignment near Denali Nat’l Park on the Friday before the Memorial Day weekend. We were very fortunate to have managers who were very flexible in our work assignments which allowed us ample time to fully enjoy the Alaskan experience. There was a definite advantage to being Workampers in Alaska as the tourist trade offered discounted (and often free) access to their attractions. 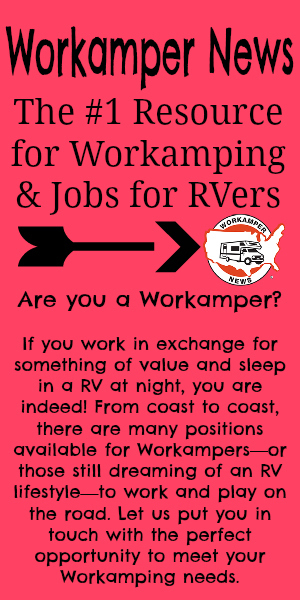 They do this with the thought that the Workampers were in daily contact with the ongoing exchange of tourists and would pass along a recommendation for their services. We were fortunate to experience several other adventures because of this perk but definitely the landing of this plane on the Kahiltna Glacier on Mount Denali was the most memorable! The flight up to Denali was rather uneventful – although flying by some of the rocky cliffs was a bit unnerving. Everything was so big that it was impossible to judge the distance from our wingtips to the mountainside. I have a private pilot’s license so I am fairly comfortable flying but this was totally outside my comfort zone. After landing, we did the usual tourist routines – stomping around in the snow (this was in July) and taking pictures. After ample time being tourists oohing and aahing, it was time to go. Because of the engine sound, everyone is provided with a headset with a mic so everyone could communicate with each other during the flight. As the engine was warming up prior to takeoff, the pilot announced that once we had begun our takeoff run, there should be no conversation over the intercom as it would be distracting to the pilot who needed his full concentration on the takeoff. That being said, the pilot revved the engine and off we went – slowly gaining speed, bouncing from the top of one snow bank to the top of the next – and over the intercom comes the sound of my lady “Oh wait! I think I dropped my sunglasses”. After a momentary pause, she continued: “Never mind… Here they are!” So much for not distracting the pilot during this crucial point in our takeoff. Our Workamper duties were rather mundane. I did a lot of painting and grass mowing – minor plumbing and cleaning. A lot of the staff’s energy was directed toward making a favorable impression upon our guests. Good staff working together creates good reviews, bringing even more people to our establishment – and at the center of this success were our managers, Gregg & Sheri Pasterick. The weather in Alaska was pleasant – usually a daily high of around 55 degrees! We ran the air conditioner for the first time on the fourth of July . Overall, it was a very pleasant Alaskan experience and we have had no regrets. We left our assignment the day after the Labor Day weekend headed back to the lower-48. Thank you to Ed Hester and Joanne Sommer for sharing their adventures with us. There are more stories like this in the Nov/Dec 2017 issue of Workamper News. You can find the online version at www.workamper.com after you become a Gold member – be sure to use the Promo Code THANKFUL18 (expires Nov 30, 2018) and receive 6 months free. $2 from every sale that uses this promo code will go to the RV Disaster Corp.